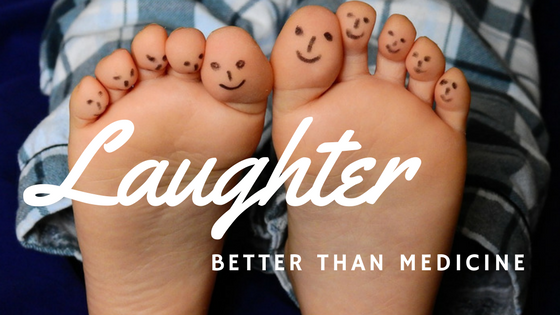 Laughter – It’s Better Than Medicine! Choose Joy! Laughter is contagious! Laughter inspires us to let go of frets and worries engaging fully in the simplicity of life. Now that’s my kind of medicine! God’s laughter gives us the assurance that Christ will ultimately triumph over evil. Three times Revelation 4 tells us there is One who sits on the throne. Envisioning the King of all kings enthroned in majesty, I rest. He has not abdicated! All authority in heaven and on earth belongs to Him. Each of us experiences, at one time or another, the barrenness of a desert place. Everyone knows the pain of difficult a season. Some more extreme than others! When we approach the other side, laugh! Joyous enthusiasm convicts nations, convincing them of God’s greatness and goodness to His people. Has God done something good for you? Remember and be filled with joy and laugh! People around you will notice and ask the reason for your joy. What a perfect opportunity to share what God has done. Life doesn’t always throw us something to laugh at. What do we do then? Nehemiah had been given permission to return to Jerusalem. Many years prior walls of protection crumbled, gates smouldered and the stones of refuge scattered. With the help of God and the leading of the Holy Spirit, Nehemiah rebuilt in fifty two days what was impossible for decades. The people gathered together listening intently to the reading of the Law. The realization of their sinfulness erupted in mourning and intense weeping. Ezra, the Levites and Nehemiah stopped the people from weeping and mourning. “This day is holy to the LORD your God. Do overwhelming circumstances grip you today? Are you experiencing deep pain right now? The distance between today and your last good laugh may seem miles apart. Take hope! Be encouraged! Morning always comes! In the presence of the Lord there is neither weeping, sorrow nor sadness. None! Just as He was present in the midst of the people of Nehemiah’s day, He is present with you today. Recently, I walked through a particularly difficult season that threatened to consume life, hope and peace. Every morning I was aware that God was granting me the option to choose joy. Daily joy was a deliberate decision, a purposeful intent. Joy became my personal fortress in the midst of intense struggle. The Rock of joy withstood! Laughter isn’t just child’s play! Its good for us all! Let’s get serious about joy! Laughter just might prove to the best medicine after all. ← Mercy, Peace and Love – Jude Contending for the Faith!